Radweb, the company behind InventoryBase, is proud to announce its latest product, Property Deck, the brand new CRM system for the property industry. Property Deck 1.0 gets officially introduced on May 2nd, 2018 at Future: PropTech. Register your tickets and come and get an early peek at Property Deck live in action! So what is Property Deck? Like a business card deck, Property Deck enables you to store contact information, with so much more to offer and in a completely unique way. Property Deck is a CRM system at its core with a PropTech twist, providing a property database built right in to make it an effective tool for all sorts of basic administrative tasks and services required when owning, renting or selling real estate. Most importantly, Property Deck stores information in a searchable system that keeps a timeline of your history with people or properties, and shareable access with your team. It’s built on the latest bleeding edge technologies, making it quick, slick and enjoyable to use, and it’ll work on any device with a browser. It’s secure, we’re talking bank-level security. It’s always on – we’re talking 24/7/365. And it’s a Platform that other developers can build on, too. What can I do with Property Deck? We’ve built Property Deck in a way that allows you to customise the information it stores and the way you view and search that information. Import your staff, contractors, suppliers, customers, landlords, tenants, prospects, partners, and, well, anyone. Add or import custom fields to different types of contacts or properties to catalog information important to you. Set a status on each contact, for example whether they’re active, being vetted, pending review or archived. Create saved lists of different views of your contacts, including different groups of people, competencies, locations or whatever you like. Log private notes, upload and share files for vetting or HR. Import or sync your property database, along with contact information relevant to each property including owners/landlord(s), agent(s) and tenant(s). Create saved lists of different views of your properties, like vacant vs occupied, for sale and for rent, or anything you like. Set custom reminders, such as gas safety checks or inspections and Property Deck will notify you when dates are approaching or due. Tag your contacts in the same reminders to make sure they get a notification too. Upload and store files and important property documents. Share files with people and be notified when they’ve accessed it. What makes Property Deck unique? 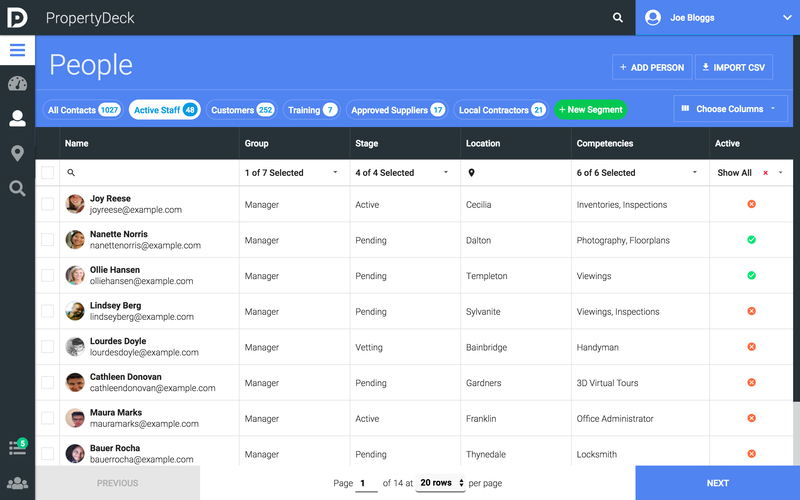 Property Deck’s Segments feature makes our CRM system one of the most powerful CRMs on the market, giving you the ability to click on a saved search to show exactly the information you want to see. In addition, in line with the European GDPR legislation, Property Deck makes it easy to comply and store compliance audit trails, giving your contacts a way to update and redact their information easily and giving you a full audit trail of all contact permission opt-ins, opt-outs and profile updates. More information on this will be posted in our help portal. Property Deck’s built in search is incredibly easy and useful and accessible in a range of ways. Just tell Property Deck who you want to search for, and/or their competencies, and/or their location, and Property Deck will return the matching results in an instant. While this isn’t revolutionary, it’s accessible across your whole team, so there’s one single place for everyone to access everything in a secure way. And finally, Property Deck connects with over 1000 apps out-of-the-box! Just register an account on Zapier.com and request an invite. Our Public API will be available to view online giving you complete autonomy to build your own integrations or sync your data with existing systems. What will Property Deck cost? Nothing. Zero. Zilch. Property Deck’s standard CRM is free. It’s our gift to you. We plan to offer premium services, add-ons and Pro features in the future, but Property Deck’s standard out-of-the-box CRM system will be free forever. Register your interest now and be notified when your free deck is ready.